Maharat’s “Fake News and Media Viability” conference brought together journalists, editors, media experts and media agencies from all over the world. 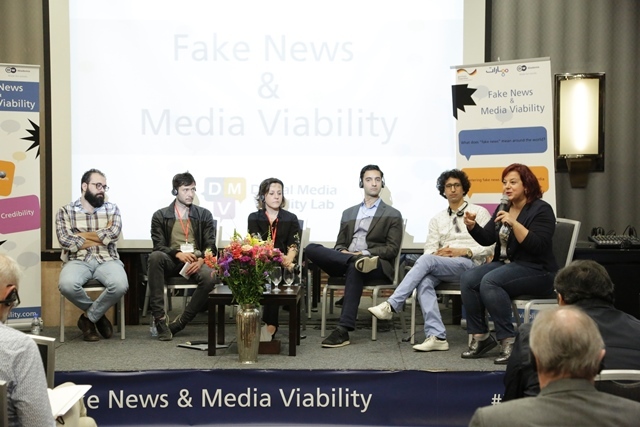 Held in partnership with DW Akademie, the event, which took place between April 24 – 26 in Beirut, covered several subjects, such as the definition of fake news and how to fight it and the meaning of a “post-truth world”. But perhaps one of the most important sessions held was the “Challenges of Media Startups” session, which dealt with the viability of media startups and the struggles they face daily to keep afloat. How do they generate their content and who do they generate it for? Is there a steady stream of revenue? Was switching from journalism mode to business mode a challenge? These were some of the questions asked by session moderator, and Executive Director of Maharat Foundation, Roula Mikhael. “As content strategists we figured out, that, even in today’s flood of news, professional business people need to gain better access to news, and they should be willing to pay, ” Ranjan Roy, founder and CEO of The Edge Group, a content strategy firm that services consulting firms and think tanks, said. But getting there was a challenge, Roy, who now heads a team of 10, added. They had to figure out which business model worked best for them: free content with ads was not a sustainable revenue stream, nor was paid membership. “People are willing to pay $5 for a cup of coffee from Starbucks, but if you ask them to pay for news then forget it,” Roy joked. After much experimenting, The Edge Group now produces content for think tanks and consulting firms who have old data they want to distribute online. Final advice here is: don’t be afraid to raise your expectations when it comes to income; sometimes companies are willing to pay because they recognize their need for your services. Cristina Tardáguila, director of Brazilian fact-checking agency Lupa, decided she had to find other streams of revenue if she wanted to grow her team. Lupa has so far given training to over 3000 individuals in 20 cities. These workshops have begun a steady stream of revenue. “We started with four team members only in 2015, and now we are 15 members,” she said. But Lupa is not the only media outlet giving workshops. Closer to home, Egyption newspaper Mada Masr relies on trainings and editorial services, as well as memberships, to fund their business. Sometimes good journalism could rise from political or cultural conflict. German journalist, Christian Gesellmann, writes for Krautreporter, the first crowdfunded online newspaper in Germany, founded back in 2014. The story of this outlet is interesting. It goes like this: various segments of citizens were starting to feel underrepresented in the German media, which was dominated by “white, male, conservative” people, Gesellmann said. And when the refugee crisis hit the country, the media producers and newspapers were also supportive of all politicians, which was not the case with the people. “So we decided to start crowdfunding a project for the fairness of journalism in 2014 and we raised about a 1,000,000 euros,” Gesellmann, who still works for Krautreporter, said. “People need to feel represented,” he added.